He is no more..A great Voice..left us forever! We as a family loved each and every Ghazal ..he sang.. I remember I was in college and any new Album of him that was released ...went out of stock ..in a Day I always ended Up thinking why I am the last one ..never on time?? We as Indians in US always wanted to be part of his concerts ..and his fablous singing.. If I start numbering his best albums..it would take me to write many posts and publish them....there are many Ghazals which I like..Surreal! punjabi Songs I loved when ever I heard them..Shiv Kumar Batalvi 's poetry he has expressed very well in his Ghazals.. I felt very sad. His voice is the best. RIP.I am a big fan of both Jagjit and Chitra Singh.Grew up listening to his brilliant music.A great loss. He made the Ghazals popular without compromising the language and the content.....Its a big loss for every one who likes to listen Ghazals. He was really a great singer..I loved so many of his ghazals..one you have mentioned..then all in Aitbaar, Arth, and then...hotho ko chho kar..they are countless. Loved his songs. Rest in peace. you know what I was thinking to write a post on him too..he is one of my most fav ones....Gosh I remember how i have grown up listening to his sweet ghazals..I pray for his family that they be strong enough to bear such a huge Loss...ameen. May he rest in peace.ameen. 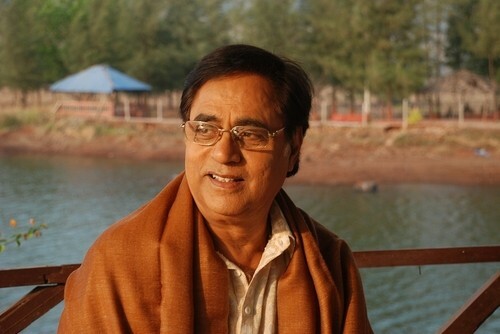 Jagjit Singh was a great singer and was one of my favourite. He had a great voice and I listened to his gazals from my childhood. May His soul rest in peace. Oh it is so sad. I have watched his live shows and in past written posts about it. all good singers ..go early! I know...most of his poetries and Ghazals were very Real! Another Guy is Gulzar I like! he was a soulful singer. Yes Aitbaar was specially with ..so many nice ghazals ..
so many.............. hard to mention one! you know his few Ghazals are so touching ....it points out real life situations. yep.I know ...he sang some good Ghazals for all of us to hear and understand!every age loved him! he had concerts all over the world...and People were glued to their chairs ..such a charisma in the voice. Everyday I hear either Chitthi na koi sandesh or Hoshwaalon ko khabar kya... It already made me cry but now as Jagjit sir is no more, it makes me cry more.